Home / hearth & home / celebration / earth day / Happy Earth Day! April 22 is Earth Day and the Natural Kids Team is celebrating in a big way. 55 member shops are having sales, promotions or giveaways. Check out the complete list of shops here. To help you celebrate, many participating shops have generously donated several of their earth friendly items to be given away to a lucky winner. There are a total of five Natural Kids Team giveaways this month and one in May, including one on our own Natural Kids Blog. 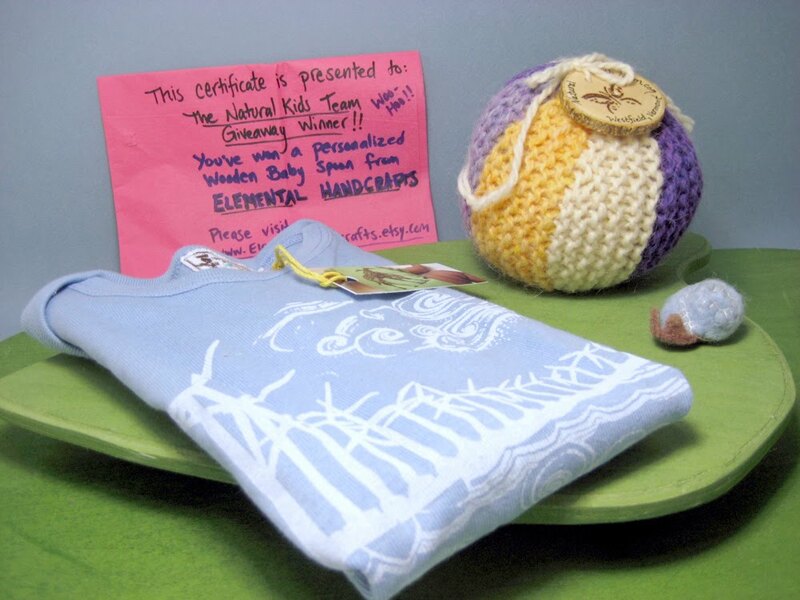 This Earth Day giveaway features terrific earth friendly items from Knitting Momma, Curly Monkey, Muddy Feet and Elemental Handcrafts. These items are all crafted using natural materials and are a beautiful way to connect your child to the earth, naturally. Knitting Momma has donated a hand knit ball. This hand knit woolen ball will provide lots of fun for toddlers and preschool age children. This ball is knit with wool and stuffed with natural stuffing. Curly Monkey has provided an organic onesie, silk screened with a sweet eco print, using non toxic ( lead and phthalates free) soft water based inks. Muddy Feet is donating a tiny felt snail. Perfect for a pocket or to add to a playset, the snail is hand sewn using plant-dyed wool felt (70% wool, 30% rayon) for the body, hand felted wool for the shell, and cotton thread. They measures a whopping 1.5 inches long (well, just over), and are about 3/4 to an inch inch at the widest and tallest. Elemental Handcrafts is providing a gift certificate for a personalized wooden baby spoon. To enter is simple, you must be a follower of the Natural Kids blog. Leave a comment stating that you are a follower and leave a contact email. Remember to leave a separate comment for each additional entry and remember to please include your contact info. Contest is open until April 22, 2010 at midnight. A winner will be announced on April 23, 2010. Winner has 48 hours to respond before a new winner will be drawn. There is another Earth Day giveaway on one of our member’s blogs, featuring more of our talented members’ items: visit the Magic Onion’s blog for more details. Stay tuned for details on our other upcoming Earth Day giveaways. To find other earth friendly items from the Natural Kids Team, search “Naturalkids team earth day” on Etsy. Happy Earth Day! What a wonderful giveaway! everything looks so crunchy and green 🙂 Im a follower on your blog! and from Elementahandcrafts the baby spoons for sure! Beautiful things – such a fantastic giveaway! I'm a follower of your lovely blog. Also a fan on Facebook. Those spoons are great! I'm a follower! jillbates at me dot com. From Curly Monkey: the tree of life onsie and the organic flower baby blanket (sorry, I couldn't pick just one!). From Elemental Handcrafts: the knitting needles. I LOVE CurlyMonkey's organic sling!! This is wonderful! Thank you. i love the branch walking blocks from knitting momma. i LOVE the flowers organic baby blanket from curly monkey. i love the wooden branch necklace from elemental handcrafts. Ooohhh, what fun! I am an admirer and follower! I am a recent follower of Natural Kids! Great giveaway and perfect for our nephew soon to arrive this June! Ooooh, I'm in!!!! What beautiful treasures. And now I'm a fan on facebook, too. love curly monkeys windpower onsie…very cute! swoon! i follow katsinthebelfry at gmail dot com. I'm also a facebook fan! I love browsing stores, in Knitting Momma's store I adore the branch stacker (though I love the lavender bunny too!) I love Curly Monkey's rocking baby wrap, can't resist it, orange is my favorite colors. I do not think I have ever seen anything as cool as Muddy Feet's pumpkin house playset, if I had the money it would be mine right now. And I think Elemental Handcrafts' ouchie pillows are just the sweetest ideas. I am a FB Fan!!! Wow. This is great. I'm glad to have found your blog and shop. I fanned you on FB. Thanks. Curly Monkey's winged onesie, so cute!!! I am a follower! This is such a lovely giveaway! http://www.etsy.com/view_listing.php?listing_id=43724575 the absolutely gorgeous personalized spoon by elemental handcrafts. oooh i am now a follower! I am a follower now! I just found the blog through plain and joyful living and will be back for more links to those fabulous etsy shops! what great shops! From knitting mama i love the brich pencil holder, from curly moneky, I think the organics tree of life vest is beautiful, my favourote from muddy feet is the pumpkin house playset and I can't get over those spoons from eleemental handcrafts… my nest baby will eating from them and not from plastic or metal!! my favourite item on knittingmomma is the playsilks – i asked her to make them! I just became a follower!!! And so happy to be so. I will advertise this giveaway and your blog on my own blog so that more people can participate in this lovely opportunity! I am a new follower and love, love the spoons! Awesome giveaway! I'm a blog follower. I'a a FB fan too! I am a facebook fan. Leeldoo at yahoo dot com. I like those give away especially from Knitting Mama. They are beautiful and stylish. Beautiful items as always from your tallented group! Love them! I'm a follower. I'm a follower! Great items! Knitting Momma…the birchmobile is so cute! Curly Monkey…I like the flock of sea turtles body suit. Muddy Feet…Love the earth day snails and all of the hemp jewlery. Elemental Handcrafts…the tree branch wooden spoon. What a super lovely givaway! I subscribe thru google reader. I love handmade, and I love natural kids. You all are so talented! Very dute! I follow the blog. I follow on facebook too. i like the play clips!!! Now, I'm following! Such great things! I love the cute owls at PolarBearCreations!! I'm a follower of natural kids! We've found so many lovely things through you. Our favorite items (that we don't already own!) are the organic hemp/terry baby wipes, evergreen play time trees, the custom personalized spoons, and the little mohair bunny. Such a list. I'm a follower…love the shops and love all your crafty folk who make such wonderful playthings for our kids to enjoy!! I'm following! I'm Mom Most Traveled or Over the Mountain Mommy. When I clicked "follow" it showed my MMT badge. oh my goodness i won! thanks you sooooooo much!!!!!!!!! WOW!!!!!!!!!!!! What a great info that you have on the wall that will help us for the Barefoot Dreams Blanketso thanks once again. Wow!It's a very special day to celebrate the place where we live in.Also,it's a good event awareness to keep in mind each person how to take care of our planet earth. It’s a pretty interesting tool. I will definitely be using it once I get the chance. Thanks for sharing! Oh my goodness, I just love those floral bags with the wood handles. Those doors are super too! Very cool! Great blog!That is a beautiful arbor! If you need to unlock or jailbreak your iPhone we can help! We have helped more then 200,000 iPhone users around the world get more from their iPhone and we update our software constantly to keep in line with Apple’s firmware updates. Regardless whether you have an iPhone 2G, 3G, 3Gs or an iPhone 4 you are in the right place to get your device unlocked fast and pain-free. If earth day will be held every month, I think, we will be able to save more money and save more trees and anything that has relation to the environment. Most blogs that boosted it got spammed like it was going out of method and are not turned off by it. They like the traffic but despise wading through the absurdity spam comments. Every year on April 22, people around the world celebrate Earth Day with events that promote environmental health and sustainability. And since it was first observed in 1970, Earth Day has grown from a once-a-year. I appreciate your post because i used to read blogs but i guess this was really a good blog. Well maybe I'll just dropped by here some other time to be updated.